SU means excellent and MI means beautiful. It is easy to say and easy to remember. It is familiar and attractive and has a beautiful meaning. Made with the finest handpicked Sumi potatoes, the taste is also excellent. SUMI POTATO has 11 times more sugar content than other potatoes for processing, giving it a rich and sweet potato taste. It is more delicious than other potato chips and very crispy too. SUMI potato was hard to make into potato chips. However, the low temperature vacuum method of NONGSHIM gave birth to the SUMI POTATO CHIP. Different from regular potato chips. This potato chip is fundamentally different from regular potato chips created using the basic method which uses potatoes prepared for processing. A fundamentally different potato chip using a better variety of potato, SUMI POTATO CHIP is delicious. A reducing sugar is any sugar that is capable of acting as a reducing agent because it has a free aldehyde group or a free ketone group. This includes glucose, fructose, maltose, glyceraldehyde or arabinose. 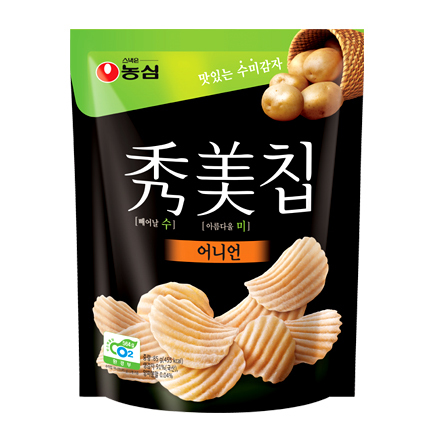 The NONGSHIM SUMI POTATO CHIP is made using the finest SUMI potatoes from Goksung, South Jeolla Province, fried in the vegetable oil of rice bran and palm oil made from coconut. 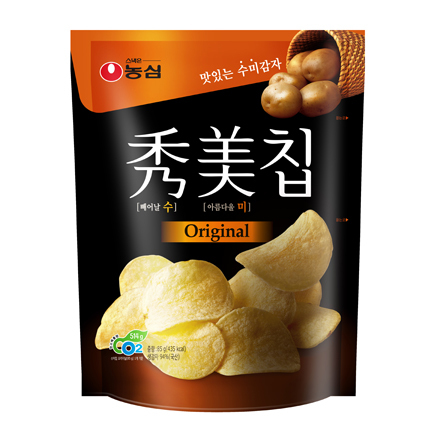 Seasoning salt and the fried and sun-dried salt of the waters of Shinan, South Jeolla Province add excellent flavor to the potato chip. 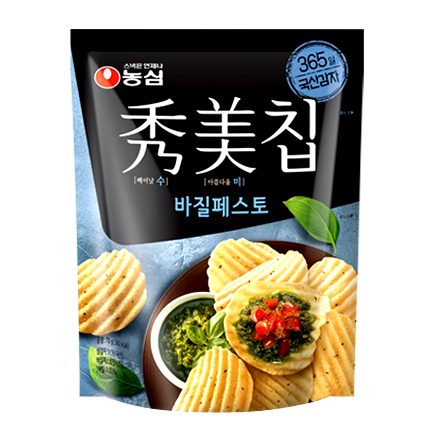 One pack of SUMI POTATO CHIP contains as much as 93% fresh Korean sumi potato. Top secret about the birth of the SUMI POTATO CHIP!! The extraordinary secrets about the birth of the SUMI POTATO CHIP have now been revealed! Sumi potato refers to what we eat at the table. However, the sumi potato contains more reducing sugar which makes it taste sweeter than potatoes for processing, and it browns easily using common techniques. Therefore, the sumi potato cannot be used for just any old potato chip. Potatoes used for conventional potato chips are not sumi potatoes but are potatoes cultivated only for processing. Until now, the sumi potato had not been used to make potato chips. However, NONGSHIM was the first and only company to give birth to the SUMI POTATO CHIP using its exclusive low temperature vacuum method. The SUMI POTATO CHIP is made in a vacuum state where the pressure is lower than the air pressure. It allows product processing even at a low temperature. The ingredients do not lose much of their taste, scent, color, and or nutrition at low temperatures and the features of ingredients are preserved. 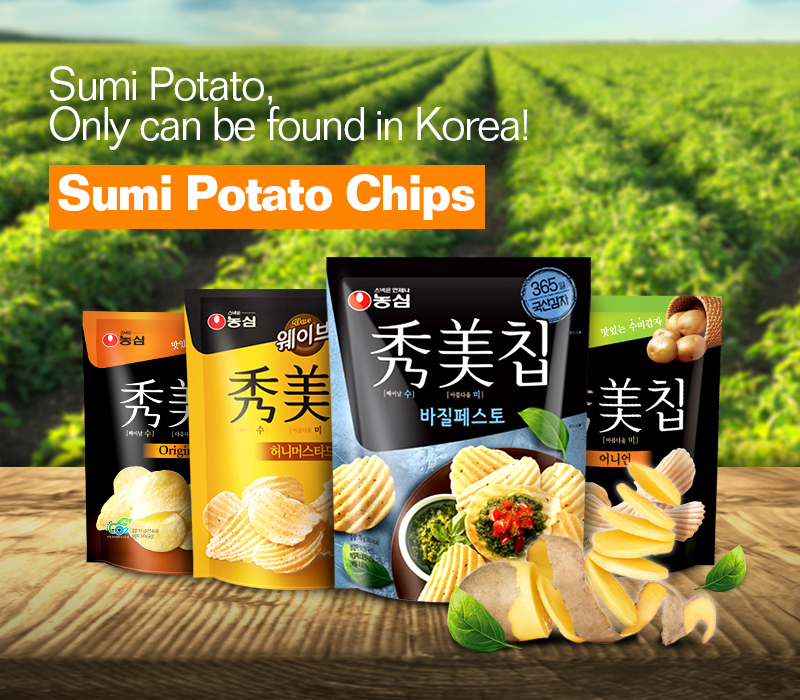 SUMI POTATO CHIP is, a premium potato chip made of Korean potato, created using our own technology and taste. (Yoosungho) Why? Why did you eat my chips while I was gone? 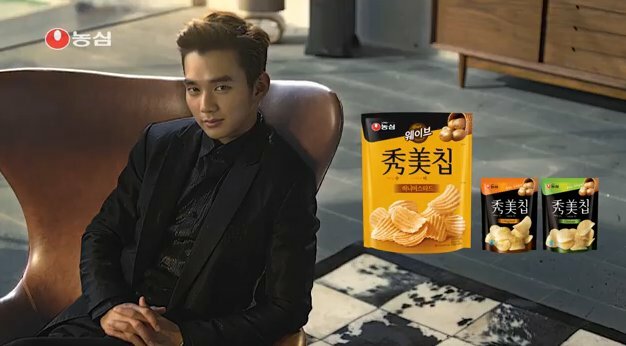 (narration) Only Sumi Chips use Sumi potatoes. 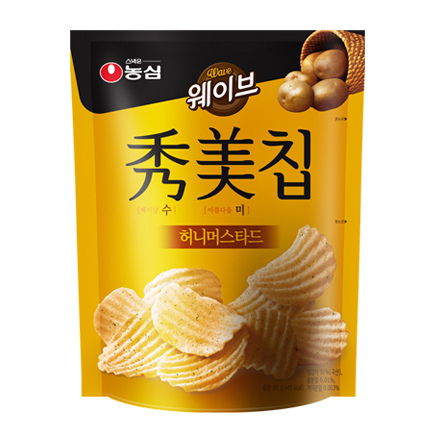 New honey mustard flavor Sumi Chips ! (Yoosungho) You shouldn’t eat just any old potatoes.